Forex dealers said besides strong demand for the American currency from importers, capital outflows mainly weighed on the domestic currency. The rupee on Thursday slumped 43 paise against the dollar to trade at a life-time low of 70.32 on strong demand for the US currency. At the Interbank Foreign Exchange, the local currency opened at a record low of 70.25 a dollar, down from its previous close of 69.89, and weakened further to trade at a fresh low of 70.32, down by 43 paise. Trade deficit soared to a near five-year high of $18 billion, data released by the commerce ministry on Tuesday showed. 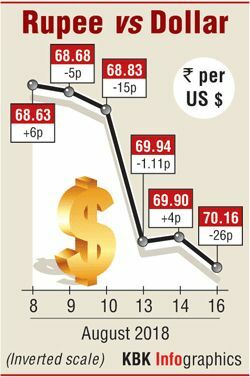 The rupee had gained 4 paise, to close at 69.89 against, the dollar in the previous session on Tuesday. Forex market was shut on Wednesday on account of Independence Day. Meanwhile, the BSE Sensex fell by 207.03 points, or 0.54 per cent, to 37,644.97 points in early trade. Foreign institutional investors (FIIs) sold shares worth a net of Rs 378.84 crore on Tuesday, as per provisional data.